Seth Grossman, the director of Inner Demons was kind enough to take some time to discuss his new film with me, and answered a few questions about his former production career and how it applied to a film that feels very familiar (in all the right ways) to those of us who watch reality TV or are obsessed with documentary filmmaking. 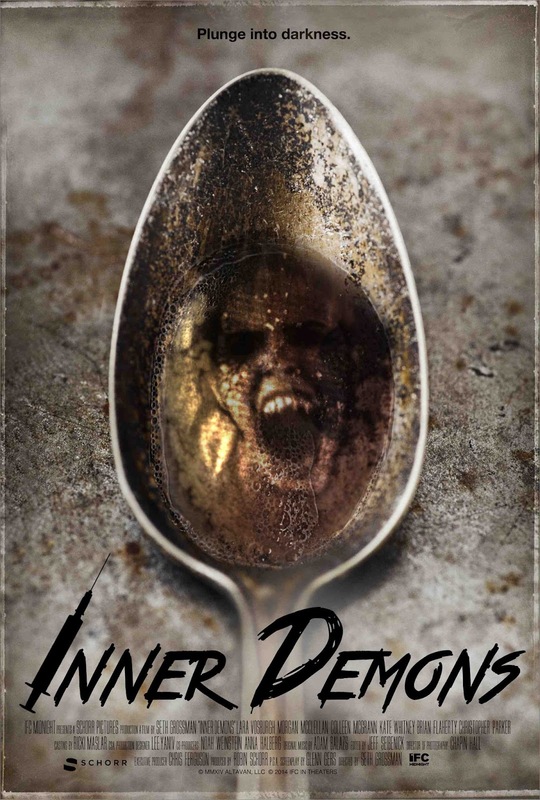 INNER DEMONS follows an 'Intervention'-style reality show crew that films an episode about a sixteen-year old girl, a former A-student, who is fighting addiction but may in fact be suffering from something even more destructive: demonic possession. The movie is an inquiry into the truth about her - with symptoms that straddle the disturbing and scary intersection between insanity, addiction, and true possession. How does your reality TV history inform how you approachedInner Demons? And here, I mean in the editing process, the characters mention several times what will be cut or spliced, can you elaborate? Reality TV informs the production in a couple of different ways, it definitely informed characters of the reality producers on the show. I wanted to explore some of the tensions I felt when I was producing reality shows, everything from Intervention to Bridezilla's, there's a desire to help the people on the show that sometimes conflicts with the desire to make good TV. You can see this in the personalities of the producer characters in Inner Demons. It informed the content of the film via the types of characters, the type of story I was telling, and the way it unfolds, and it also affects the way the movie was made. We shot it to be a POV film, not exactly found footage, but a documentary/reality style TV show; we shot with a lot of zoom lenses, we did a lot of improv in our rehearsals and on set, we did things like whip pan to the action instead of being on the action exactly as it happened so it was like we were discovering things in the moment. We had the actors wearing lavalier microphones for most of it instead of booming them, so they had a lot more freedom to improvise and move about on the set and we could follow them wherever they went. We lit things so they had a lot of freedom of movement. The aesthetic mimics that of a Reality TV program, the big difference being that when you're shooting reality or documentary, you wind up shooting days and days to get a few minutes of footage, you're able to boil it down to about a 100:1 shooting ratio, but with a film, you don't have the luxury of shooting hundreds and hundreds of hours of footage and b-roll, so we had to find ways to make it seem as though we had that amount of coverage. People denigrate reality TV because it feels like it's voyeuristic and you're seeing people at their worst, but I think there are some great programs, and I think a show like Intervention had enormous social value and was really a part of the conversation we're having in this country about addiction and recovery, and addiction as a disease. I'm proud of the work I did on that, and I was excited to be able to explore some of the feelings I had about reality TV in a fictional film. It's rare to have the opportunity to be able to go back and survey your experience and say, how can I dramatize this using characters who aren't like me, who might be a little more exploitative, who might be a little less emotionally intelligent in some ways, and dig into what working on reality shows like this means to people, and how it affects the cast or subjects of those shows. There's a gallows humor that's necessary to keep the trauma at arms length when you're working on shows that deal with serious subjects like this. You can get really depressed when you're exposed to physical, emotional and sexual abuse on a regular basis and just have to hold the camera and document it. It was a defense mechanism. Documentary film style is a very popular medium - what made you decide to take the POV route with Inner Demons? Do you feel that it brought a special element to the film? I'm really interested in the relationship between the documentarian and the subject. I felt like the best way to tell a story like that in the genre space is through the reality style filming. I wanted the POV of the movie to say something. We very well could have shot it in a traditional way, but part of it was necessity, given that we had 14 days to shoot the film and we had a fairly extensive story to tell with different locations and stunts. We felt like we had to move fast and have it be handheld. It's really about reality producers and the way they relate to their subjects, and the way that people on camera open up and the relationship that forms between the cast and crew of any kind of documentary reality show. At the heart of this is a love story between Jason and Carson. Whatever else is happening, he breaks all the rules to try to help her and it eventually leads to disaster. That core relationship between those two was the reason I wanted to do it in this reality style. How much input did you have on Carson's character and how much direction did you give into how her character developed? I had a lot of influence on that. When I came on board the project there wasn't a complete script yet, there was something between a script and a treatment, and I worked with writer, Glenn Gers, to complete a script, and then once we started going into prep I took over and did revisions myself. I based Carson on a couple of different addicts that I'd worked with during my time on Intervention - I'd worked with a couple of young women who were her age or a little bit older: a 19 year old heroin addict living on the streets of Portland, and a 21 year old pill and meth addict living with her mother and stepfather in Riverside California. I took a lot of attributes of them and a lot of the attributes of their family dynamics to create the character of Carson. A lot of it has to do with how she is getting her drugs and who is helping her. Most addicts on their own don't have the wherewithal to get high, so who is her enabler? Where is she going? Who is she using with? When did she start? How long did this go on? What led to this? Why she using? - all these things I had to ask myself and build a backstory around her so that she felt like a well-rounded person. When Lara Vosburg came on board, there were certain little tweaks that had to be done to make it a better fit for her. Were there any specific horror films that you took inspiration from before you started filming? I watched a few movies while we were in the script and prep phase. One of my favorites was The Last Exorcism, an Australian documentary style horror film called Lake Mungo, Paranormal Activity 1 and 2, and Grave Encounters. Grave Encounters didn't have the character development that I was going for with Inner Demons, but it had some great technical elements. What do you hope people take away from a film like Inner Demons? I hope they learn something about documentarians and their subjects and how that can all go awry...but I really hope that it scares the piss out of people and I hope they have trouble sleeping at night, and I hope they enjoy the ride. I think it's a fun ride, and if you start to really identify with the characters and be scared for them and feel what they're going through, there's enough jumps and laughs and eerie moments of dread...it's a fun ride.